Elmina (C/R), April 15, GNA- President John Agyekum Kufuor on Thursday, called on all stakeholders in the labour market to implement the ideals of the new Labour Act to facilitate the creation of a congenial labour market, as part of the nation's drive to become a preferred investment destination. He pointed out that, the lofty ideals of the Act, which is expected to create an open and serene platform for mutually beneficial interaction among organised labour, employers and government, would serve no purpose unless they were strictly adhered to, and implemented to reflect both the letter and spirit behind them. President Kufour made the call when he opened a 'tripartite national sensitisation workshop on the Labour Act 651, for members of the Ghana Employers Association (GEA), organised labour, media representatives and other stakeholders, at Elmina. The three-day workshop, under the theme " Promoting Social Dialogue Through Partnership", is geared towards educating the participants about the provisions of the Act, to enable them have a better understanding of the law, and to facilitate its smooth implementation. It is also serving as a training of trainers' forum, after which regional workshop on the Act, for selected key persons and stakeholders would be organised. The new labour law was passed by Parliament on July 25, last year and received Presidential Assent on October 8, and came into force at the end of last month. He noted that work on the Act started as far back as 1995, and that on assumption of office, his government decided to pursue the enactment of the bill to its logical conclusion, and promoted broad-based discussion nationally to facilitate the drafting of a law which would be acceptable to the tripartite committee and the general public. President Kufuor observed that, in order to progress, the nation must "take a leaf" from best economic practices of some rapidly developing and advancing nations around the world, whose economic success is attributed to good cooperate governance. He said together, these concepts nurture a sense of ownership and partnership among the major stakeholders within an economy, and cited the Southeast Asian countries, popularly known as the "little tigers", as the best example of such successful countries. The President however, said as a negotiated document, Act 651, may not perhaps meet all expectations of each interested party, but nevertheless, goes a long way to address their concerns and protect their respective rights. President Kufuor said government was pleased that the Act has been received favourably as a forward looking and inherently a piece of legislation that should deepen the nation's sense of incorporation. He was happy that for the first time in the country's history, labour and industrial issues have been decriminalised and that duties and rights of both workers and employers have been clearly defined, with procedures for legitimate and time-bound strike action spelt out. "Clearly, this will improve relationships within the market and enhance productivity. It will additionally help avoid any violent and crippling strike actions which tend to undermine harmonious industrial relations", he declared. 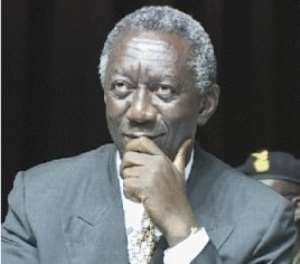 President Kufuor said a salient feature of Act 651 is a blend of the letter and spirit of the national constitution with those of the ILO Conventions, and said the combined force of these laws, enhances democratisation at any given work place, by protecting the rights of individual workers to be members of unions of their choice. He said this was a credit to the TUC, which has been the traditional and exclusive mouthpiece of labour, since the nation's independence, to have voluntarily agreed to "this evolutionary process in the labour market". The President pointed out that with this new development, the law was creating a challenging opportunity for all Ghanaian workers to try to chart a new course towards further development and growth of organised labour in tune with international practices. He also touched on the fact that, the law also catered for the welfare of casual and temporary employees as well as persons with disabilities and female employees, and said provisions made to protect casual and temporary labour should reduce some of the exploitative tendencies, which have bedevilled the labour market. The Minister of Manpower Development and Employment, Mr Yaw Barimah stressed that the policy on poverty reduction would succeed, if the parameters for attracting local and foreign investment were expanded to generate employment, and the necessary regulatory and legal framework, being put in place to attract investors. He said it was for these reasons, that the country's labour laws were reviewed and codified, and called on all stakeholders, not only to commit themselves to making the law work, but also getting a proper and common understanding and knowledge of its provisions to ensure that the maximum benefits were derived. Mr Barimah expressed the hope that at the end of the workshop, all the social partners would agree on a consistent and common understanding and interpretation of the provisions of the Act. He was also hopeful that through their deliberations, recommendations would be made to improve the industrial relations practice in the country. He expressed gratitude to members of the technical sub-committee who drafted the bill, as well as the 'Sigma One Corporation' of the USAID for sponsoring the workshop. On their expectations, the TUC secretary-general, Mr Kwasi Adu-Amankwah, said to a large extent, the new labour law, which he described as a "compromised document, have met a lot of the expectations of the TUC". He said for the first time in the history of the country, industrial strikes have been given legal backing, but pointed out that some aspects of this provision, needed to be clarified, since there are some restrictions and prohibitions with regard to strikes embarked on by workers of so called essential services. He said it was imperative that the workshop deliberates extensively as to which sector constitutes essential services. The TUC boss also stated that the expectations of the labour leadership are that the regulatory institutions, such as the Tripartite Committee, the National Labour Commission (NLC), would be properly resourced to effectively discharge their duties, since according to him "too much lip service, is often paid". He gave the assurance that the TUC leadership was ready to form a partnership in facilitating the creation of the requisite atmosphere for enhanced socio-economic growth. Mrs Rose Karikari-Annan, Executive Director of the Ghana Employers Association (GEA) observed that the new law has a lot of innovations, which everybody has to be proud of. She said harmonious labour relations are a prerequisite for economic development, and enhanced investment, but regretted that this was often marginalized. She described the workshop as being in the right direction, but said there were transitional issues that needed to be resolved and implemented, and called for a frank and passionate discussions to remove what she termed conflicts areas. The GEA Executive Director said as employers, they looked forward to a deepening partnership and "want to take back home " what can be implemented at the enterprises level". Mr Ralph Franklin, USAID representative, said his organisation was committed to giving the requisite support towards the creation and functioning of an effective labour commission. He commended members of the technical sub-committee, which worked on the draft bill and others who helped in processing it, and suggested the establishment of national labour management partnership "Hall of Fame" to give appropriate recognition for their efforts. President of the GEA, Mr Ato Ampiah praised President Kufour for being the first sitting President to attend such a workshop, as well as for his commitment towards ensuring a harmonious industrial relations in the country. The workshop would be deliberating on topical issues including ' the Act and the employer-employee relationship, the Act and the worker-union relationship and dispute resolution.